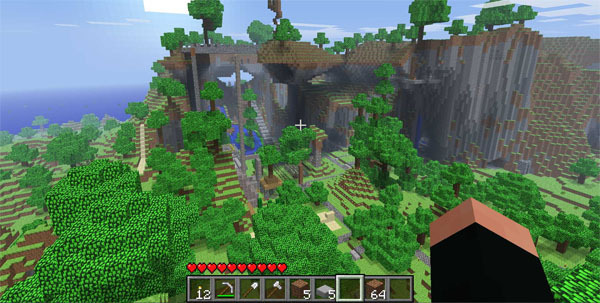 Minecraft is described by its Wikipedia page as a sandbox building independent video game. “The game is focused on creativity and building, allowing players to build constructions out of textured cubes in a 3D world.” It enjoyed its full release out of beta this past weekend, so I thought I’d finally write about the fun I’ve been having playing this game for the past few months. You start out as a simple, empty-pocketed person utilizing a first person shooter kind of viewpoint. You can see one hand floating in front of you, as well as a world being generated around you. There is likely grass and dirt; probably trees here and there. You may be in a desert surrounded by sand and cacti, or on a shore next to a vast ocean. There may be cows, pigs, sheep, chicken, or wolves wandering the area near you. Or maybe you fell into lava and died already. It happened to me once. Anyway, assuming you’re alive, you need to find a tree. Walk up to it, and begin left clicking to punch it. Yes, I know. You’re punching a tree to break it down. It may seem weird, but that’s actually tame in comparison to some things you haven’t seen yet. Once you have the wood from the tree, you need to make a crafting table. The table gives you a 3×3 grid to build your tools in. You’ll need an axe if you want to chop down trees a little faster. You could use a sword if you want to slaughter some of the animals around you for food or wool or leather. But what you MUST make is a wooden pickaxe. With this you can begin mining stone in your general vicinity. With that stone, you can make a stronger axe or sword or pickaxe. Even a shovel if you have a lot of dirt to get through. And by this point it’s probably mid-day of your first day in Minecraftia. You have a lot of other things to do and consider in the very near future. You’ll need some of that meat from the animals nearby to keep your food meter up. You could use wood and wool to make yourself a bed to sleep through the night. You can utilize leather to make yourself some body armor. The focuses right now should be light and shelter. Because when night arrives, the monsters come out. This is a brief glimpse into the start of a much larger adventure, and definitely my favorite part of the game. You have so much more to see and build in this humongous world that is your own playground. You’ll run into obstacles, sure. But you can always rebuild. Things can be made better or stronger. There’s even material that is invincible to explosions if you know where to look. At Minecraft.net, you can play the Classic version for free. The link is small and on the right side of the page. Classic is a basic builder. You have infinite blocks and can build whatever. The full game is now selling for $26.95. It is well worth it.